Tomorrow is move-in day, and what better time to talk about security systems, since there will actually be possessions in the house for the first time. Security is kind of a tough thing to blog about since the more I publish about my setup, the easier it would be for miscreants to subvert it. I’m sure everyone reading this blog on a regular basis is an honest member of society, but you never know who might come in through Google one day. So… for that reason, I must say very little. What I will say is this though: I’m going to lay out a few details in this post about how we secure the house and then I’ll do a separate, more comprehensive post on all the great home automation we’ve built in. To start off with, we have contact sensors on every single opening in the house. Doors, windows, sliders, Nanas, garage door… you name it. When any perimeter orifice is opened, the central alarm/automation system knows about it. This is not only useful for security but also for doing cool things like turning on lights when doors are opened. The second layer of protection is glass breakage sensors. We have these all over the house. They work by detecting the audio frequency emitted when glass is broken. If any window in the house breaks, the alarm/automation system knows about it. The third layer of protection is motion sensors. As the name suggests, these trigger when they detect movement in the house. Some people choose to keep these on only when the house is empty and some people have certain zones on all the time. These are also useful for doing things like automatically turning on the stair lights when you’re about to walk up or down stairs. We also have a siren on each floor and one on the roof for maximum ear piercing delight. When the alarm triggers, a monitoring service is alerted as well as a few cell phones including mine. There’s a bit more to it than this even, but we’ll just leave it at that for now. I will say this: if you’re building a house, do not skimp on wiring, whether it’s alarm wiring or data. It’s very tempting to ask yourself “do I really need a sensor here?”, but spend the extra few bucks and run every single wire you could possibly need. You won’t regret it. Most of these sensors are less than $20 apiece (for top of the line, great ones even!) so all you’re really paying for is your wiring guy’s labor. Well worth it. Do not worry about overwiring. Do worry about underwiring. I’m really looking forward to move-in day tomorrow. There are several more big posts coming including the hardwoods, the landscaping, the kitchen, and the bathrooms. UPDATE: Nina in the comments reminded me about cameras. I totally forgot to mention those. We have several infrared, high resolution, night-vision cameras which monitor almost every angle of the house 24 hours a day. The footage is available live via a streaming server as well as recorded via a dedicated DVR. Everything is also on battery backup in case of a power failure. The shades from outside the house. Only the uppers are down in this shot. 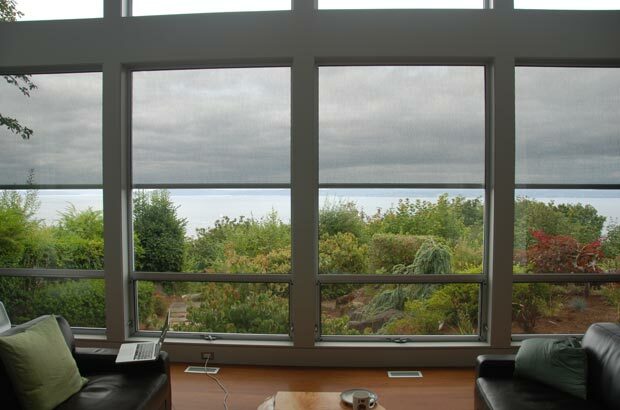 Given that the house faces Puget Sound to the southwest and the view side is almost completely glass, it was of utmost importance to engineer a sun management strategy that allowed the house to stay as cool as possible in the summer and as warm as possible in the winter. For sun control in this situation, there are a few things you can use: long eaves which help shade your windows when the sun is high in the sky, interior shades which block solar rays from hitting your interior surfaces, or exterior shades which block the solar rays before they even hit your windows. The eaves were a given as they fit with the style of the house, but the shades were a very long project in investigation and implementation. The great thing about interior shades is that many different brands are available and you can use them year-round no matter what the conditions are like outside. The downside, however, is that your glass still gets very hot, so they are less effective at keeping rooms cool. The great thing about exterior shades is that they block upwards of 90% of the sun’s energy before it even hits your glass so they are excellent at keeping things cool. However, since they are exposed to the elements, they must be retracted during high winds (of which we get plenty). 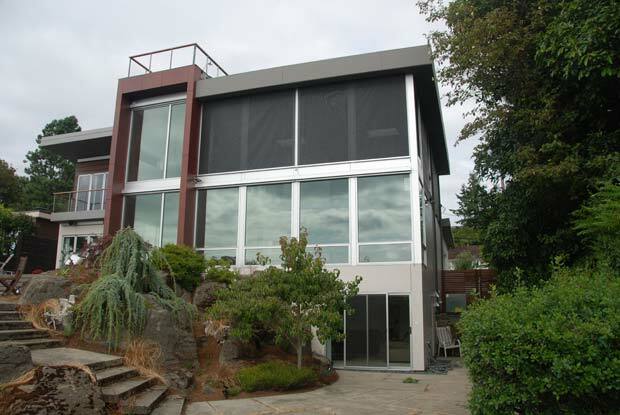 Since eliminating heat in the summer was our top priority, we chose exterior shades from Somfy. 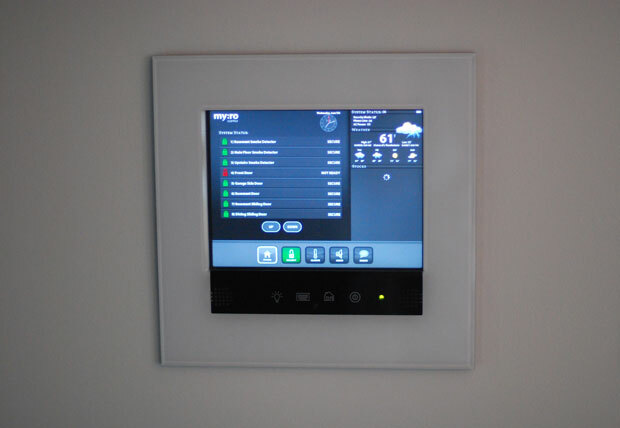 Somfy is the only company that makes motorized exterior shades that tie nicely into most home automation systems. It would have been nice to have our pick of brands since there is a lot about Somfy I don’t particularly care for (like the fact that they use an old school serial interface), but since they were the only game in town, we went forward with them. The most difficult part, however, was picking which Somfy system to use. They have a system called RTS which uses easy wireless controls, but the blind motors are “dumb” and can’t give the system status on their position. They are also either “fully up” or “fully down”. You can’t send a command to a blind telling it to move to 10% up at 10am and then 20% up at 11am, etc etc. The other, newer system is called ILT. These blinds report their positions to the automation system and also can respond to the sort of incremental commands mentioned above. The downside of the ILT system, however, is that it uses a wired serial interface. Somfy just released a wireless Z-Wave interface but it came out too late for us to use it. The Z-Wave interface was supposed to come out last January and we had planned our project around it, but Somfy kept stringing us along on the release date and it didn’t end up coming out until our blinds were already being fabricated. This was extremely maddening as it caused us to run more wire through the house, purchase more equipment from Somfy, and end up with a system that was not Z-Wave aware. Another maddening thing about the system is that while older Somfy motors like the RTS have an integrated sun and wind sensor that can automatically retract blinds during periods of high wind, the ILT offers no such sensor. Instead I’m in the process of rigging up a Davis Weather Station on my roof that can report weather conditions back to the home automation system, which will then in turn raise and lower the blinds automatically. Yes I know, it sounds like total overkill. Even though I’m generally very happy with the blinds now, I will admit that I probably overthought the situation a bit. I was under the impression that when the blinds were down, you would barely be able to see out the windows. For this reason, I wanted to do things like incrementally raise and lower the blinds throughout the day according to sun angle. I basically wanted to only lower the blinds as much as necessary at any given time. As soon as I lowered them for the first time, however, I was shocked at how little they obstructed the view. They are so transparent that sometimes you can’t even tell they are down. Had I known this from the outset, I might have just gone with the RTS setup and not worried about precise blind positions. Long term, I’ll probably be happier with these as I can do things like detect when a window is open and only lower the blinds to the top of that window, but still, the many hours of research and work to get this system into place were not as necessary as I originally thought. As you can see, there’s virtually no reduction in view when the blinds are down. While Somfy has been extremely spotty in providing support for my project, my other two partners on this project were great: Atrium Shade fabricated and installed the shades and my buddy Danny Mavromatis of Myro did all the ridiculously cool and complicated home automation tie-ins. Atrium provided the shades (as well as other interior shades throughout the house) at a very reasonable price and Danny expertly enabled me to do things like raise and lower them from my iPhone or any other IP-connected location.